Sharon was over two years into her recovery from cancer. 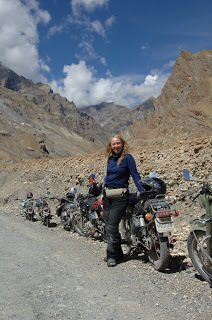 With the help of Challenge Cancer Through Adventure, she spent over a year planning and has now completed a “trip of a lifetime” … to ride a Royal Enfield Bullit 500cc motorbike over the highest mountain passes in the world in the Spiti Valley up in the Himalayas. Day 1 on an Enfield … Slowly getting used to the feel of my Royal Enfield Bullit. 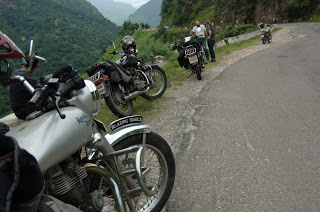 I have been reciting the word in my head over and over during the first days ride…”up to slow down, down to speed up” I’ve only ever rode an Enfield once in India and that was many moons ago and trying to remember that, not only are the gears on the wrong side, they are back to front as well (i.e, one up and 4 down) as opposed to the standard UK/Jap/German configuration, also, the brakes are on the opposite side as well. Confused? Yes, I was. 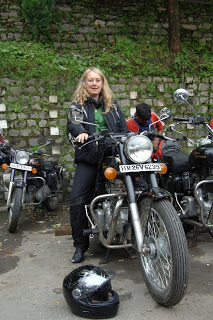 After an early start from Shimla and a pre-bike briefing on the complexities of the Enfield and how to kick the bike up successfully (just about mastered this after about 10 goes)!! we set off on the road of many hazards. There were pot holes, cows, and landslides a plenty, not to mention the kamikaze truck drivers who overtake on blind bends and a heard of horses and that was all in the first hour!! Gradually after a few hours riding it all started to come together and I could begin to relax (!) and enjoy the hour after of hour of twisty turns. the torrential rain and fog we had a bright moment. Another day in paradise, high up the mountains, we had a change of plan. Today we should have been on our way to our tented accommodation but due to a landslide the road is now closed and looking likely to remain so, hence we have stayed an extra night here. A really beautiful little village with an ancient temple complex dating back hundreds of years and an important pilgrimage site. 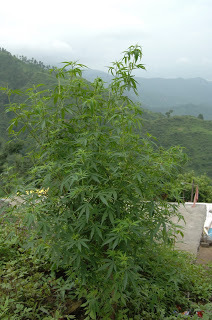 Sarahan is small town in Himachal Pradesh of India. It is the site of famous Bhimakali temple, dedicated to the mother goddess Bhimakali, presiding deity of the rulers of the former Bushahr State. The temple is situated about 180 kilometers from Shimla and is one of 51 Shakti Peethas. 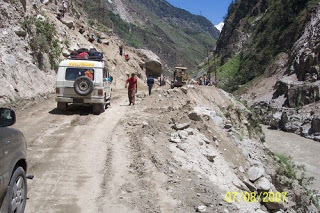 The town is known as the gateway of Kinnaur. Seven kilometers below Sarahan is the river Satluj. Sarahan is identified with the Sonitpur mentioned in Puranas. Its very typically Indian but with a Nepali/Tibetan feel to it and plenty of momo and chai stops to keep me occupied on the rest day. After a breakfast of paratha and curried vegetables we set off back down the mountain pass taking in all the twisty turns in reverse. I didn’t know it yet but today turned out to be one of the most exhilarating and challenging days of my 30 year biking history. We rode through landslides, over boulders and rocks and through thick sand and mud and dust but the most challenging of all were the river crossings. Hesitation is not an option and I soon discovered that the only way was to literally just “go for it”, point the bike in the right direction, easy on the throttle, feet up and go. The Enfield is a truly remarkable machine… on many an occasion I felt the back wheels slip from under me as I hit boulders and rocks on both the river crossings and through the thick mud and gravel road surfaces and it kept true to its “bullit” proof name and carried me thorough in once piece. Upon arrival at our hotel we were greeted with well deserved cups of steaming hot chai and paneer pakora. 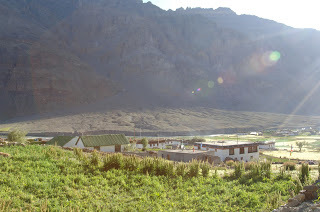 After dinner I drifted peacefully to sleep in the extremely comfy, spotless bed of the Shangi La Hotel surrounded by views of Mount Kinnear Kailash from my bed, a perfect end to an amazing day. After a short ride to the nearby town to get our innerliner permits sorted for the Spiti Valley we fuelled up our bikes (mine came to R300, about 3 quid) ready for tomorrow’s big ride to Tabo and its famous monastery. 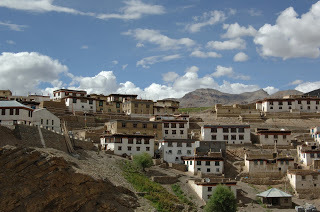 “Tabo monastery stands in the cold and arid barren desert of Spiti with 9 temples, 23 chortens, the monastery held its 1000 year of foundation in 1996” I had been reading about Tabo and its monastery and its somewhere I was looking forward to visiting. However, it wasn’t to be as later on in the day we heard reports of another landslide and the road was completely impassable. The plan for today was to double back the way we came down the Karchem to Wangtu Road (I use the term road very loosely here!!) The only problem with riding is that you cant take photographs plus you are concentrating all your efforts on actually keeping the bike upright in the first place. Ok, I didn’t keep it quite upright, I fell off in some knee deep mud, luckily for me it was soft mud or I would have been in trouble, anyhow no harm done. I have come to the conclusion that this trip is not for the faint hearted and that yesterdays posting being the ride of my life will shortly be replaced by another more exciting and equally crazy road. Another ride in the extreme…due to a landslide we were informed that we wouldn’t be able to ride to Tabo and the only option was to retrace our steps and ride back down the original Wangtu-Ranku road (by this point I really was beginning to feel like a contestant in one of those Japanese game shows where the only objective is to stay alive and in the least pain possible!!). I am sure I will look back on this but today I am wet and tired and having to ride damp from yesterday’s soaking. I managed the river crossings successfully, however, my worst nightmare, the thick slippery mud finally claimed me and I dropped the bike in mud up to my knees. Luckily for me the mud was very soft and I didn’t hit any hidden rocks so essentially not a bad day all in all … just very wet and tired. 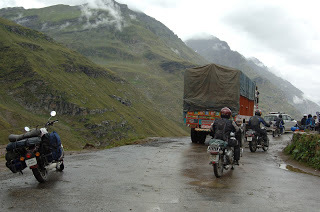 we climbed higher and higher until we reached the top of the Rohtang pass. Admittedly, I wasn’t looking forward to today’s ride but the weather turned brighter as we descended over the other side of the pass and I managed to successfully ride the rock, mud and boulders without coming off. However, as always in this unpredictable place, the riding was soon to become increasingly more difficult as we climbed another pass (Kaza) and the dreaded river crossings loomed. I did manage quite a few but they were becoming more difficult and deep with hidden rocks and boulders around every turn. I ended up dropping the bike with the bike landing on top of my leg with me wedged underneath. Luckily, someone was looking down on me and Ranju our mechanic rushed to my rescue. Unluckily for me after completing the Rohtang pass and the increasing altitude and a few more soakings in rivers crossings coupled with 8 hours riding I decided I couldn’t carry on and decided the spend the last two hours ride in the Jeep. After an exhausting day we arrived in Losar at 6pm. I was finding it increasingly more difficult to breathe by this point and after feasting on fried momo’s and noodles I took to my bed early. However, I woke up at 2am unable to catch my breath, I decided to sit up which helped slightly but after a sleepless night of tossing and wheezing I decided to consult Ayo our medic. He decided I would benefit from extra oxygen and hooked me up to a canister for a quick 10 minute blast after which I was feeling much better. And so off we set from Losar to Kibber. The ride can only be described as unbelievable, the weather was kind and I was enjoying the twisty turns and stunning views of the Himalayas. Remember though, never to take your eyes off the road or you will end up as part of the road, this is potentially hazardous riding conditions and you need 100 percent concentration 100 percent of the time. I’ve never rode on the surface of the moon (obviously) but I”d imagine the landscape to be kind of like this (well, in my imagination anyway). Thankfully the ride wasn’t as difficult as previous days and we all arrived safely in Kibber before sunset. After a brief stop at Kaza (not Gaza) to re-fuel we discovered that the world’s highest petrol stations’ pump had broken down and was unable to pump petrol. In typical Indian style we were assured that it would soon be fixed and to try back later. The plan for the rest of the day was to ride to Kibber via the amazing Kee monestry with the hope that the pump would be fixed by morning. As it happened, it wasn’t! so the only option for tomorrow’s ride was to set off early at 5am and keep riding until we ran out of petrol and we would be met at some point on the pass by a man with some petrol!! Yes, it does sound bizarre but this is India and this is how things work. “Breakfast is served at 5am”, we were told, and I knew this day was going to be a killer! Two boiled eggs, hot chai and Tibetan bread later we set off on the ride to end all rides. Well, to cut a long story short, I didn’t make it! About 3 hours into the ride the air was becoming thinner and I was wheezing again, I lost concentration on the Kaza pass, felt the back wheel go from underneath me and I fell to the right side of the bike (luckily it wasn’t the left or I would have been over the edge). I smashed my head on the rocks, no soft mud this time, bruised my ribs but not my pride and decided to call it quits for the day. This time I had nothing to prove, I had rode the Rohtang pass successfully and the Jalori too and exhaustion had well and truly set in past the point of no return.